Don't gag, but it's true - I found correlations. So I've been ploughing through this book for the better part of last year. It's not an easy book to read because it isn't fiction. I like fiction. I love quantum physics because it's so utterly bizarre and blows your mind in ways that classical physics (observable, safe, familiar, established, makes sense) can't. And for a factual, historical, unmathematical, non-allegorical* treatment of quantum physics, Gribbin's book is truly excellent. However, that doesn't change the fact that it is still non-fiction and doesn't have dragons, faeries, undying love against all odds, knights, magical rings, hobbits, flying carpets or the ultimate triumph of good over evil. 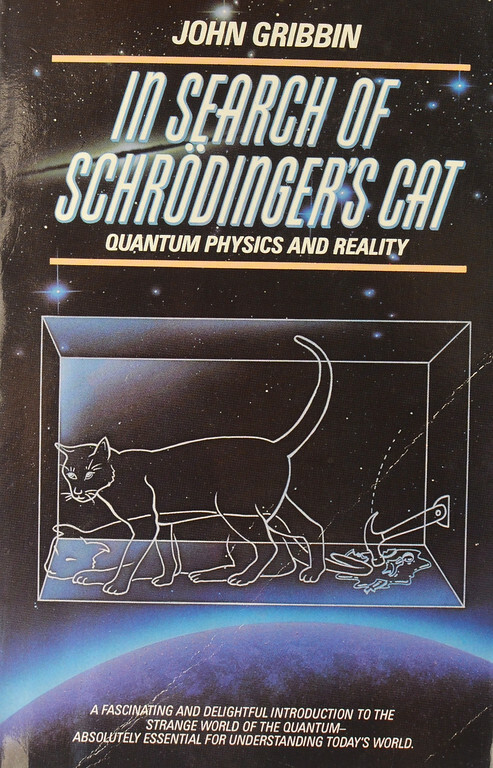 Regardless, quantum physics is cutting-edge beautiful. When it makes sense at all, I mean. Which it often doesn't. It isn't so much "thinking outside the box" as it is "the box may or may not be there depending on whether or not you're sneaking a look at it". Niels Bohr (1885-1962) famously said, "Anyone who is not shocked by quantum theory has not understood it." Couldn't be more true. Especially since I barely understand it and I'm still shocked. But anyway, this is a sewing blog, for goodness' sake, so I'm not going to wax poetical about Science. Especially Science that I can't fully wrap my mind around and probably never will. Suffice it to say that I'm three-quarters through the book and have to keep taking breaks to assimilate the stuff. The first half was fast to read because it was what I already knew from college days but the later bits were very skimpily covered then and thus required more digesting time now. A lot more digesting time, in fact. Like months (during which I got distracted by um.. fiction containing those very fascinating elements listed in the preceeding paragraph, ahem). While reading the book, though, I found myself thinking about sewing. Lest you think I'm an irredeemable nutcase, let me clarify that not everything makes me think about sewing. For example, I can go many hours in the day, particularly when I am swimming, running or reading (fiction, especially), when nothing sewing- or craft-related invades my thoughts. However, in this instance, I was struck by how the evolution of quantum theory reminded me a bit of the sewing movement that's taking this generation by storm and my own reaction to it. And that made me happy because while there are aspects of this modern sewing frontier that I'm not crazy about, there are many others that are worth cheering for. Let me share! Just for background, quantum physics is one of two pillars of modern science (relativity being the other). It is the science of very small things that make up matter - things even smaller than the atom. It is responsible for lasers (and all the applications thereof), molecular biology, genetic engineering, computers.... in other words, it revolutionized the world. I wanted to say that just to show how big of a deal it is, especially on hindsight. But way back when the first whispers of it emerged, it was so crazy and way-out that, well, let's just say that not a whole lot of people embraced it. Not only was it newfangled, it also seemed in direct opposition to the established and hallowed principles of classical science. The people who took the idea and ran with it were the ones who were game for a paradigm shift and willing to accept what essentially went against everything they'd known about the physical world. While most of these guys were primarily physicists, they were supported by others who weren't - engineers and mathematicians, for instance. If you could imagine a bunch of really smart experts saying, "But that's impossible!" over and over again, and then eating their words and then, decades later, getting Nobel prizes for Astounding Achievement In Scientifically Convincing People Of That Same Impossibility, you'd have a pretty good picture of the history of quantum physics. Now, indulge me because I'm going to stretch the analogy quite a bit and throw in some personal culture. The sewing environment in which I grew up was - for want of a better expression - old fashioned. Skills were handed down by word of mouth and apprenticeship - mother learned from grandmother; daughter learned from mother, and so on. Or else people went to school and learned from teachers who wrote textbooks filled with technical drawings and vital statistics and who had centuries of garment-making experience. People who sewed were called seamstresses or tailors - and they were every bit as competent as the titles suggested. They were also primarily garment seamstresses, and were often so as a vocation (in which case they were called tailors) or means to clothe their family. When they purchased a sewing machine, it was of one kind - treadle - and it was for the purpose of garment construction. Projects were assiduously completed, often supplemented with copious amounts of hand-stitching, over long periods. They were also drafted from scratch or (where available) adapted from foundation blocks and patterns and precisely fitted. If you wanted to learn to sew, you were also asking to learn to draft - it came as a package deal. Sewing was as much a science as it was an art. Your skill as a seamstress was as much a representation of your drafting technique as your ability to stitch pieces of fabric together to make decent-looking seams. This was my understanding of sewing when I came to the US almost a decade ago. It was, in my mind, a classical approach to sewing- part national culture, part generational inheritance. Then I stumbled upon the Modern Sewing Movement. I couldn't wrap my mind around it. It was completely opposite to what I knew. People learnt to sew from the faceless interent and beautiful glossy coffee-table books. They bought fancy machines that did everything from automatic buttonholes to 500 embroidery stitches while you were checking your email and drinking coffee. They called themselves sewists, sewers and crafters and sewed rectangles into tote bags and wallets and oven mitts and stuffed animals and organizers for their minivans. For fun. They whipped up projects in 30 minutes or less and virtually high-fived each other for turning out sixteen different skirts during their toddler's afternoon nap. They straight-pinned everything, hand- basted nothing and eyeballed whatever lay in between. Garments were assembled from tea-towels, elastic, pillowcases. Patterns were made by tracing around a favorite pair of sweatpants. If one drew a pattern and were able to grade it to different sizes (using computer software), one called oneself a designer and launched a business. One's skill as a seamstress sewist was as much in fitting pieces of fabric neatly together as one's eye for great fabric choices and color schemes. Sewing was less of a science (which was intimidating) and more of an art (more available to the masses). To say I was shell-shocked was putting it mildly. I was simultaneously aghast and intrigued. I felt like I wanted nothing to do with this casual, modern way of sewing while at the same time being unable to stay away from it. It went against everything I'd ever been taught. And yet, where in the past it was something one inherited only if one were lucky enough to have a mentor, thousands of people were now able to learn sewing at any level, enjoy it, make a business of it. What used to be an exclusive, practised skill was now an accessible hobby and a fun way to pass an afternoon. People no longer stoically dipped their feet into the source that was some ancestor's knowledge; now they jumped into the river from any bank or tributary and let it carry them, uninhibited, wherever it flowed. Those of us who'd grown up learning to sew the classical way would understandably find this new, nonlinear, free-for-all approach quite foreign. Observe: anyone and everyone was teaching everyone else to sew. Anyone and everyone could write a sewing book, make a pattern, sell handmade clothes. No one needed to be formally schooled in the fine art of vintage dressmaking to share what they knew. I was already disoriented in a new culture whose artistic history (including dressmaking and sewing in general) was so completely different from my own but to also be in a new time, where there seemed to be no rules for sewing, where anyone, of any skill level, could be an expert in anything if they believed strongly enough in themselves, was absolutely terrifying. "Mum," I would whisper-shout on the phone, traumatized, "they sew clothes that don't really fit. And they're okay with it! I can't find anyone here who can help me learn to draft. I'm going to die!" Obviously, I didn't. Besides, bigoted though I was, I couldn't deny how, for the first time, the doors to the world of sewing had been flung wide open. And, how as a result, there was in the air an excitement that pulled many, many people into a craft that had shed its old and (dare I say) marmish image for something new, relevant and fun. It wasn't just in the USA, or even "this part of the world" - this happydemic had even spread to my homeland. A couple of years ago, the Singapore newspapers ran a story of people, after decades of noninterest, catching the new sewing bug and making small craft items for personal satisfaction and commerce (or something like that). Further, if the countries represented by my blog visitors are any indication, it's a worldwide renaissance of sorts. And what a revival! I love that you can now learn to sew by reading a website because it brings the craft to shut-ins and teenagers and busy mothers and someone halfway across the world. I love that people are sewing to sell because it showcases great business role models for our kids. I love that there are both instructional books written by experts who've worked in garment industries for yonks and inspirational books written by regular folks to teach a beginner how to sew a dress from a straight rectangle. All these translate to more learners being able to find someone whose words and teaching style make sense to them. And more learners successfully sewing is always a good thing. Back to physics now. You know the end to that story: the world embraced the newer quantum physics as well as the older classical physics. Both frameworks were good, conflicting though they seemed initially. Scientists made peace with their differences and similarities and celebrated their complementariness. It changed the way we look at the world and the only impossibility left about it is how our lives would be without its benefits. When I was reading my fancy book and feeling my sewing deja vu, it wasn't related to whether or not anyone was a sewing expert or whether quantum physics was a more accessible form of physics to the masses than classical physics (oh heavens, no). Remember: I did say that the analogy between needlework and that world-changing physical revolution is a very loose one. It was my mindset: I am the classically-trained student of the arts (or science) - comfortable in my own established ways of sewing, drafting, fitting, designing, embroidering- standing on the edge of a new sewing frontier. I could choose to pooh-pooh it and turn away, claiming personal cultural conflicts and whatnot, or I could open myself to it and let the ones who pioneered it teach me what it was all about. Then I could have both. Both is not bad at all. Sounds an awful lot like true learning to me. 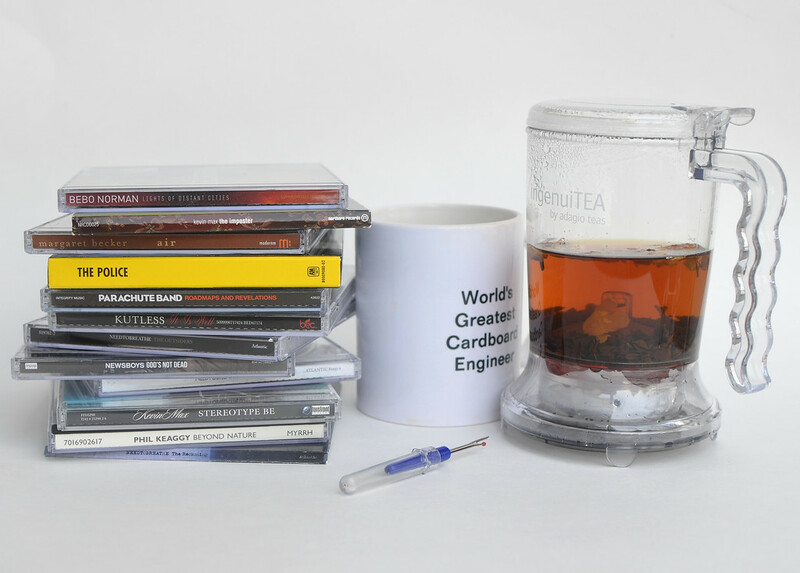 It's my crafting arsenal for 2013: music, caffeine, a good brewing system, my overachieving cardboard self-esteem reminder and my seam ripper. My philosophy is this: if I plan to make a lot of mistakes (which hopefully translate to learning), I won't be disappointed if I do mess up. Plus, everything I actually finish sewing will then seem like a miracle. And now, onward into the new year and our Make A Bag series! I started out planning to blog as I sewed but decided to finish all 12 bags and photograph them before even starting to write my posts. More comprehensive this way, I think (one hopes). * For some allegorical titles, try this and this. Well said! But now I must know what kind of a tea mug(?) that is! Is that the "good brewing system" itself? Do tell! Yay to PK's Beyond Nature! That's my only comment. I studied biology and physics and ended up teaching myself to knit and sew recently. ;) Taking one and two dimensional materials and making three dimensional useful objects out of them? Brilliant! I learned to sew by destroying yards and yards of fabric and breaking who-knows-how-many sewing machine needles on our former home-ec classroom Singer sewing machine. I took a class the first chance I got (summer before college, using a scholarship to a different university, still so pleased they let me do that), then have hacked it ever since. I would love to learn the true art of sewing, and hope to make some progress in that direction in 2013. But I'm awfully thrilled to have been able to hack my way in this far. Have you seen "Infinity", not about physics at all really but about Richard Feynman? I have never understood physics anywhere near as well as I would like (even the classical version), but I thought the movie was lovely. There's a scene in there where his advisor says, "You're wrong." and then, a few seconds later, "but wait, if we..." or something along those lines. Essentially just what you described in this post. Whoa, slow down. I started to read your post and had to back up and re-read. I'm not the academic type. I suppose I started out 'the old fashion way' of learning to sew. Mom would not let me use her machine until I took a sewing class in school (7th grade). I basicly stuck with clothes for my children. Then when the nest was empty, I got into the craft side and haven't looked back. I like quick & simple. Physics is way over my head and not really willing to learn. Quantum Physics is sci-fi to me. I will stick to simple fantasy. But lovey blog. I'm sure I got something out of it, I think. I LOVE your mind and the way it works! I am one of the ones that did not grow up sewing or drafting, but had always been captivated by it and how it all came together. (I also and amazed at woodwork and how a lump can become a beautiful piece). The problem though is that these skills have been lost on our society. So yes I "draft" my sons pants from a pair that already fits or feel limited to commercial patterns because I did not know there was another way...that is until I came across your blog a year or so ago. I am always amazed by your posts and the things that you create. I read through your drafting series before I had my son and have committed to learning how to sew from a sloper this year! So thank you for your creative, scientific mind! I have learned so much and appreciate the time you put into your blog and its readers! Just discovered your blog and feel I have found a kindred spirit. Your posts have been inspiring me to create! My kids thank you for your tutorials and great ideas. Ha! LiEr you are a woman of so many talents and the mug is so apropos! I can relate to what you are suing, I had learnt the traditional way from my aunt during my school holidays. She is s talented seamstress and undertook tailoring classes as well, which were quite popular in the 80s in India, where every girl in the house would know to sew. Times have changed and with it sewing isn't as common or popular in households as it used to be. Sadly, the modern version of sewing world is still not accessible in India and the commercial patterns aren't locally available yet, yes of course one can buy through the net but it is a costly affair considering the exchange rates. I have recently moved to Kuala Lumpur , Malaysia and find the modern version of it and i am going to take the plunge tomorrow when I plan to buy my first automatic machine brother innovis 950 and a serger 3034d. Hoping for an adventurous ride ahead and yes I do plan to make patterns for traditional Indian Clothing a reality, someday in near future. The physics teacher in me approves of your message! Yes, I am constantly seeing physics in my sewing and especially quilting. I don't think very many people realize just how much math there is and can be in quilting. When I taught my students about quantum theory and relativity, we called it "wacko physics." It really is so difficult to wrap your mind around. I highly recommend a book called "How the Universe Got Its Spots." Quantum physics from a female physicists point of view. As Spock would say, "fascinating." P.S. I have that same exact lovely wonderful tea pot, the Ingenuitea. It makes me giggle every time it "tinkles" tea into my cup. Gross, but hilarious. I love that comparison. I learned to sew from my mom (but from patterns, and learning to fit them, not nearly as technical as real drafting, but still a long way from the current trend) way before sewing was cool. And have been somewhat perplexed but also pleasantly surprised by the transformation of sewing from frumpy to trendy. Sewing has always been the anomaly in my otherwise totally tomboy array of interests (science included). Which is only one of the many reasons I like your blog. You not only actually understand the correct way to sew, but you are also brilliant and all science-y (not your standard sewing blog). It isn't exactly common, which is what makes it awesome. I absolutely love this! As a physics instructor, I'm always seeing connections between physics and (fill in the blank) - crocheting, crafting, art, etc. etc.! Thanks for sharing your thoughts!! I LOVE this! As a physics instructor, I'm constantly seeing connections between physics and (fill in the blank) - crochet, crafting, art, etc. etc.! Thank you so much for sharing your thoughts! On a side note, I'm an internet-taught crafter. As much as I would have loved to learn my grandmother's sewing & crochet tips and tricks, her passing when I was a young child didn't allow. :( I'm hoping to pass down the little I know to my children! Awesome post, LiEr! I'm a closet quantum physics freak, too! Have you read Hyperspace by Michio Kaku? Brilliant. It's a little outdated now that string theory is kind of well-established, but it's totally fascinating. I'm on the beginning of my sewing journey, although my mom was a good "sewist," I'd say, when I was growing up. She certainly never drafted anything and just sewed from patterns. I'm learning as you noted, from blogs and books and I might take a class or two. But now I want to be able to make clothes that fit perfectly!!! Thank you - this was a real eye-opener of a post! I suddenly realised that I might just be holding myself back because, having coming from an old fashioned, academic kind of background (although in other areas than sewing), the fact that I am self-taught internetty kind of sewer makes me feel like a bit of a fraud and therefore I can't possibly address things like tailoring. Which is of course rubbish, I just need to fix my head. This year's resolution - make actual clothes! Wow, you put into words what I've been thinking and feeling! I, too felt aghast at the new and loose sewing methods and less structured 'sewists'. But, at the same time I am learning new and faster, leaner ways to sew and am enjoying sewing even more. It seems we all can learn things from each other - the traditional 'seamstresses' and the new 'sewists'.